When I am in the mood for late night slop I love having a cheap slice of za at Pie By Night, Megabite or Numero Uno. You can't beat the price but you can certainly beat the quality. 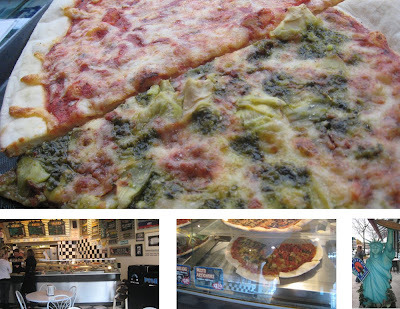 I feel that the best pizza spot in Vancouver is Nat's Pizzeria. I am not the only one because Nat's has received many awards in this city. Their slices are a little more than those dollar slice joints downtown but you can taste the drink when you are not drunk. The interiors are nice and some of the people behind the counter make you feel like they are New York imports. The just have that NY shtick to them. After you order the pizza ($2.50 - $4.00) they throw it in the oven so it can be served hot. If you haven't go and try their pizza and if you are interested, their sandwiches are also real good. 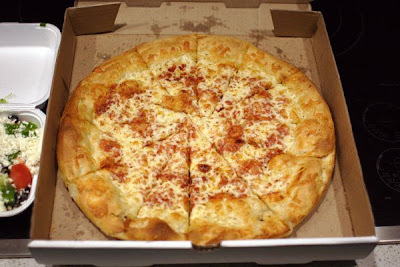 My personal favorite pizza is the margarita pizza, simple and clean. On the international stage our pizza doesn't cut it, we could never stack up against NY or Chicago. PS - I love greasy Pizza Hut. I mean love it. Since I am on the ramen mission, this place is a must. 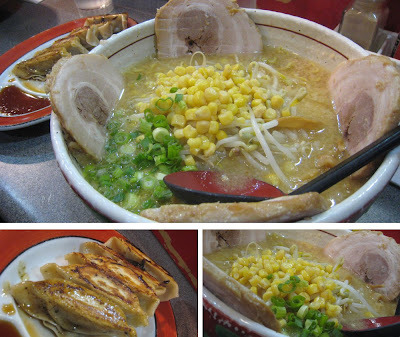 Kintaro is considered by many to be the best ramen in the city but that was partially because there was no competition other than Ezogiku but now there is. Took a trip to Kintaro and based on recommendations from ilovefoodblog I got the chashu miso ramen with fatty pork and rich soup. The soup with a rich taste was good, almost great. 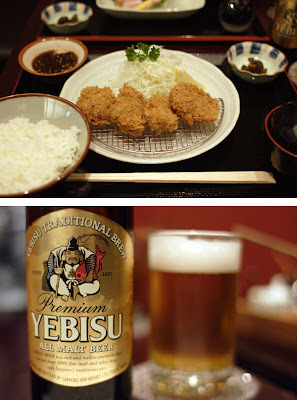 I had a sip of the shoyu version and I think I liked it better. The fatty pork I ordered was way too much for me, it made me need a coke to help digest. Getting the chashu bowl is definitely worth it, you get a couple more pieces of pork for a couple dollars more, it makes the ramen a full meal. The gyoza was so so. We all know how important it is to know where to eat but knowing what to order is also key. The atmosphere in Kintaro is ok. Basically, a place you go to after snowboarding or when you need to have bowl of ramen, not your date spot. If you do take a date there, you at least know the bill will be cheap. There is a big circular community table, a few small two man tables and the bar which seats about 8 people. Sitting at the bar can be fun because you get to watch the dudes behind the bar do all the ramen prep. 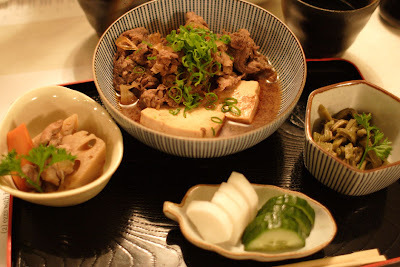 Next time, I am ordering shoyo chashu ramen, lean pork with cheese. Never had the cheese. Anyone?????? Sometime you feel too lazy to cook but you also don't wanna get away from the comforts of your couch and tv. I've got a few spots dialed for these occasions in Vancouver. 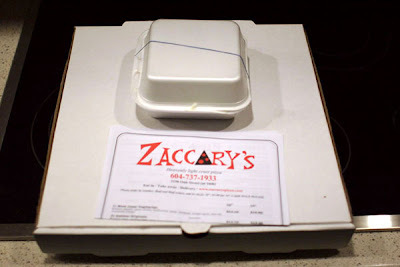 I'm fortunate enough to live within the delivery restriction of Zaccary's Pizza. Hidden away just south of Broadway on Oak St. lies this small mom & pop's pizza joint. The man that takes my order always sounds grumpy over the phone. Maybe that's part of the charm of this place? I've tried their Italiano Originale w/ roasted garlic, anchovies and fresh mozzarella and it was fantastic. But this time, because i'm a plain margarita pizza lover, i ordered a plain cheese Marg. Large of course so that i have left over cold pizza for the next day. Pizza is best eaten fresh out the oven or cold the day after! Oh, almost forgot. You MUST try their greek salad!!! Honestly, i 'm not even a big greek salad fan but this one blows my mind. Fresh tomatoes, peppers, olives and grated feta cheese with their special mix of vinegar and oil. Could be one of the best greek salads in the city! The pizza isn't cheap in price, $19.80 for the large 14". The Greek is $6.75. Oh and they ONLY take cash! 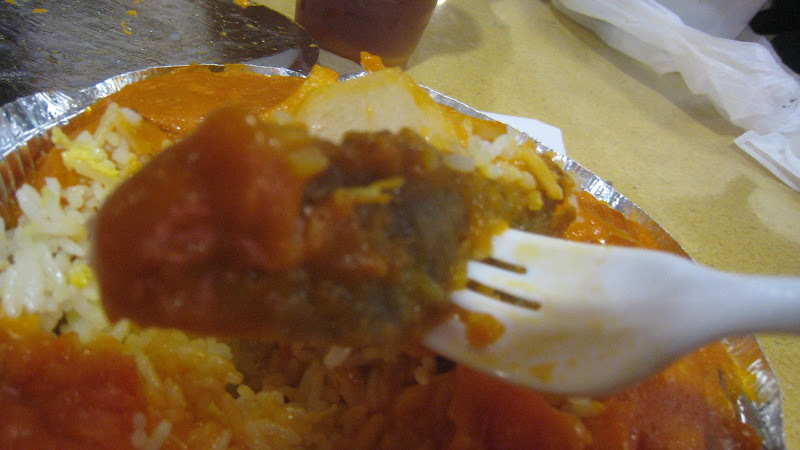 Took a trip today to Crystal Mall for some slop at lunch and it was one of the worst experiences of my life. First, the parking. The underground parking lot is set up weird, kinda like a European round about. Insert a bunch of bad drivers in a round a bout you have a recipe for trouble. We were lucky to find a spot real quick and ended up privy to an argument over a parking spot, where two men were yelling and pushing at each other, it almost broke into a fight, I quickly interjected and somehow it dissolved. It was weird cause they all got good parking spots but one guy felt he should have got his choice of the two. Second, the seating. There was a lack of seating in the mall. Our food took about 20 mins to get ready so I managed to find a seat but I also became the guardian of the table. I had to fend off person after person speaking to me in Cantonese and once I had to chase a guy down who just decided it was OK to take the chair. I am not Chinese and had to communicate mostly with awkward hand signals. 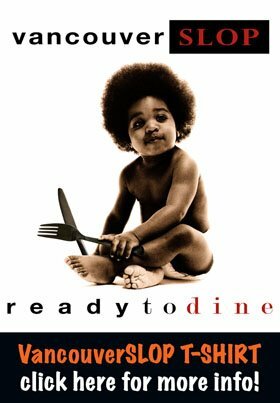 Once we finished the meal, and I stood up and someone was quick to take my chair, it felt like playing musical chairs and battling for a seat when the music stops. I literally just stood up and my knees were not even fully extended and someone was already sitting in my chair, I could feel her knees against mine. I could have gave her a lap dance we were so close. Third, the music. It was a long sitting for mall food and we were close to the speaker where Cantonese music was blaring, after about an hour of this high volume music it was about all I could take. 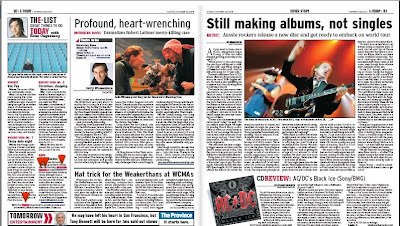 It was louder than a table at dim sum with a microphone. After one hour they didn't even play one Andy Lau track, lol. Fourth, the food was flavourless but I liked my iced lemon tea. I think this is my favorite bar in Vancouver. 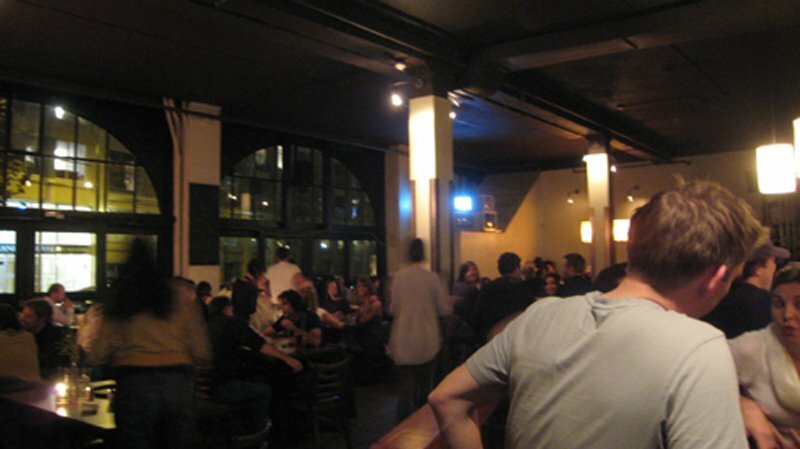 The Alibi Room has reasonable prices, a great atmosphere, a strong list of drinks, conveniently located on the fringe of Gastown and is large enough that it can host a good number of people. The reason why I like the Alibi Room so much is because it is very social, you can get up and walk around and talk to other people and even dance if you are in the mood. There are too many bars in this city where you feel chained to your seat. On the weekend, people can be found sitting at their table, at the bar or just standing around downstairs conversing in a group. At late hours, downstairs you will find a DJ, some more seating and another bar. The major issue with the Alibi Room is that it closes at 1:00am, by the time you are getting a little tipsy and feeling good you have to go and find another bar or club to hit up. From the times I have eaten here, I have not been happy. Today, the fries were a good snack but the two halibut cakes for $11 were a pretty poor value. 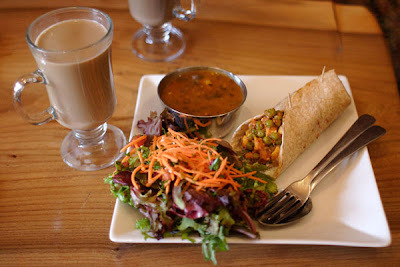 Even though i love to eat out and enjoy Vancouver's food and dining, i do not eat out all that much. 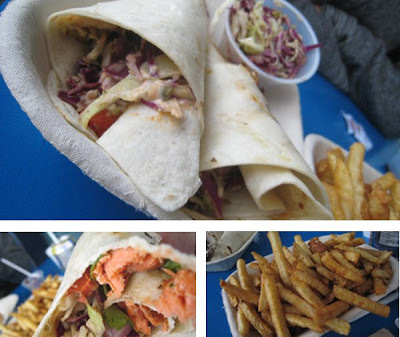 To keep things fresh on the blog, i've decided to post some Vancouver food for eating in. 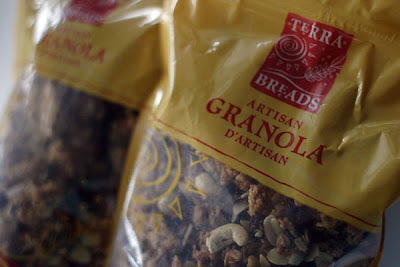 This post is regarding my latest addiction, Terra Breads' Artisan Granola. You can get these at your local grocery stores such as Capers or Choices and most places that sell their bread. Also at any of their own locations. What makes this granola far superior over others is that they make their granola with fresh organic ingredients. 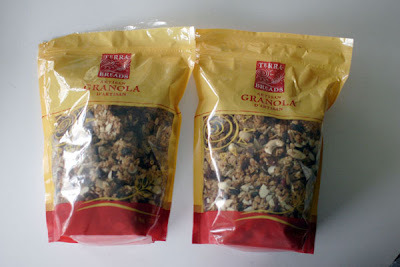 Also this granola is nice and moist and chewy as all other granola are dry and flakey. I enjoy a bowl of yogurt & Terra granola every morning. And sometimes another bowl between breakfast & lunch and maybe another for an afternoon snack. Yep, addicted. They come in 2 sizes. approx 480g bag is $8 and the 1kg bag is $15. hint: Capers sells them for a dollar more than Choices. Since the last ramen post sparked so many comments and the fact that I have ten days do try all the ramen spots, I figured I should pay a visit to Benkei to try the ramen again. My favorite thing about Benkei is the value, you can add more toppings for just 50 cents more. I added more bamboo shoots and an egg. I love having an egg in my soup. You even get a stamp card and when you get to your tenth bowl, it is free. I had 25 mins on my parking and I managed to sit, order, eat and pay all in that time frame. The service was good, and the food came quick and was nice and hot. 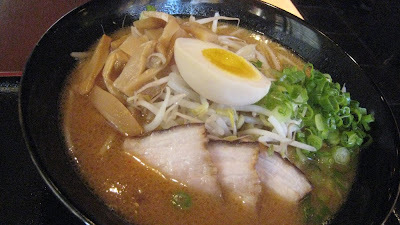 I ordered the miso ramen ($7.50), the broth was good but again nothing insane. When I think of all these ramen spots none of them stand out as being a clear undisputed champ. If you like ramen I would go recommend paying this place a visit as it is one of the cheaper ramen spots. 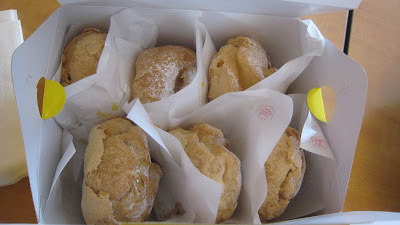 Previous Benkei review which has more photos. I decided to get a bite to eat with a few friends. We were going to end up in a club in Gastown so we decided to start our eating and drinking escapades early. Started off in the Revel Room. This is a relatively new spot to Gastown, the atmosphere is great and the restaurant bar seemed to draw an older business crowd. The place is decorated with some Edison bulbs and a row of Stay Puff Marshmellow men, looks great. The place was packed, the three of us had to wait about 20 mins at the bar before we could sit somewhere. 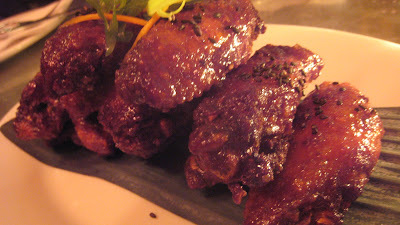 We first ordered the wings for 11 bucks which were really bland, and maybe 10 in number not worth ordering at all. Then we ordered the mini burgers for 11 bucks, the meat in the mini burgers had a great taste, and the bun completemented nicely. For 11 bucks we got two mini burgers, I thought the value could have been better but I was happy with the taste. The mini burgers are great but I am not sure what else is good on the menu. Overall after my two visits I find that it is a little overpriced for the value. No plans on returning unless it is just for drinks. 238 Abbott Street, Vancouver, B.C. Why: A good friend of mine does the food blog vancouverslop.com. 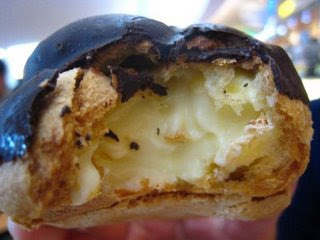 It inspired me to share a really insider foodie tip I know, although I hope it doesn't come back to, um, bite me. Every day, this Chinese eatery offers two takeout specials for less than $5. Just make your choice and chill while your massive portion is cooked fresh and good. Cheap and tasty? You're welcome. 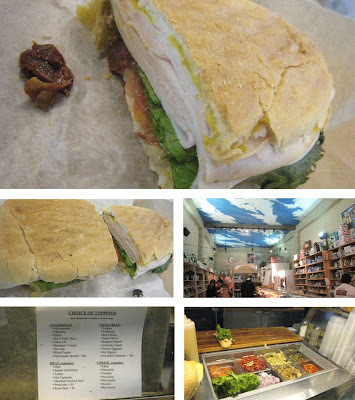 One month, I will hunt for the best sandwich and I think I know where the answer is already and it is not here although this place makes a good sandwich. I took a trip to La Grotta Del Formaggio for lunch. La Grotta is a nice Italian deli located on the drive (Commercial Drive) just south of First Ave. One of the best things about La Grotta is your choice of toppings. 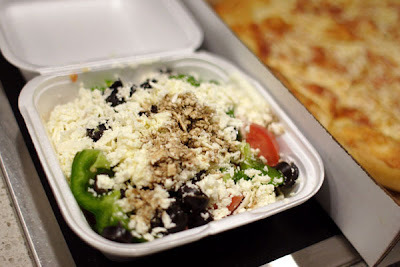 You can choose from a list of different condiments, your choice of seven different cheeses, seven different meats and a long list of vegetables including lettuce, tomatoes, red onions, green olives, roasted peppers, artichoke hearts, hot peppers and sun dried tomatoes. I ordered the turkey sandwich and added pesto mayo, oil and vinegar, emmenthal cheese, artichoke hearts, tomato, onions, and some sun dried tomatoes on a medium sub for only $6.00. 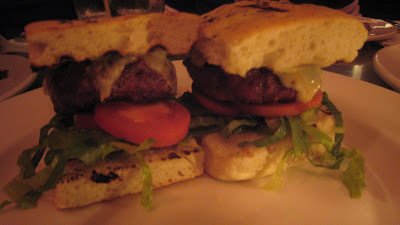 The portions of meat were good and they even grilled the sandwich with a nice push button griller. 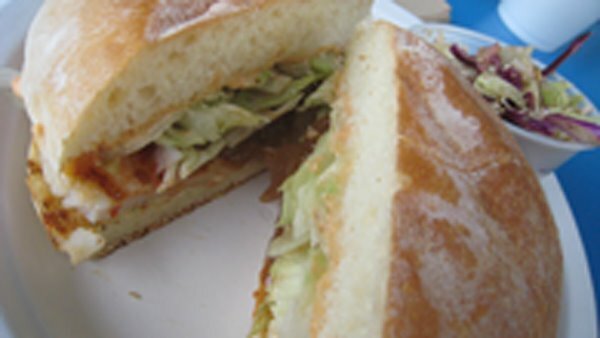 The bread was tasty which is a very important component in a sandwich and overall the sandwich was tasty and filling. In comparison to my favorite spots for sandwiches Finch's and La Galleria in Edgemont Village, I don't find the ingredients they use are as fresh. The selling feature of La Grotta is the variety of toppings. One of the better spots east of downtown for sandwiches, definitely worth checking if you like sandwiches but I prefer both La Galleria and Finch's. 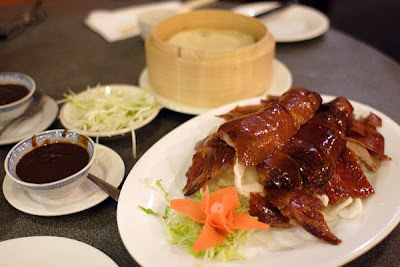 One reason why I love Richmond is because of all the Hong Kong restaurants, unfortunately in Vancouver there are only a few HK style restaurants near the downtown core. HK cafes are great, the atmosphere is nice, the value is incredible, the servers wear some kind of cute uniforms and they have good late night deals on food. You could make an uninteresting book or blog with all the different uniforms that are in HK cafes. My filipino buddy and I walked in and were quickly greeted in Chinese. Our confused look and response of "for two" wasn't enough for them to stop speaking Cantonese and they quickly said some more words in Cantonese but we followed their arm directions. My regular order at these restaurants is the baked pork chop on rice. 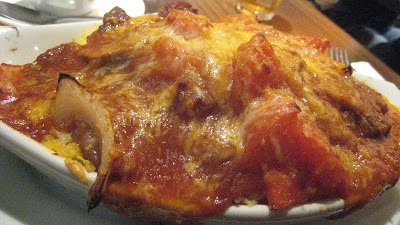 It is a pork chop or two, on a bed of rice, baked with tomato sauce, cheese, egg, onions and other vegetables. At Copa it was $9.75 but some places you even get soup and a drink for that price. At this place the pork chop tasted bad, it was spongy and tasted processed. It was a real low quality piece of meat. The overall flavor was ok but the taste of the cheap pork permeated through the hot tomato sauce and cheese and just left me unhappy. I was told by friends that some of the other dishes are ok, but I won't be back to order the baked pork chop on rice again that is for sure. I am pretty sure I won't be back unless someone tells me what to order. Ok, so this month I was out of town for a bit so I will make my monthly challenge easy on me. For October I will try and find the best Ramen spot. 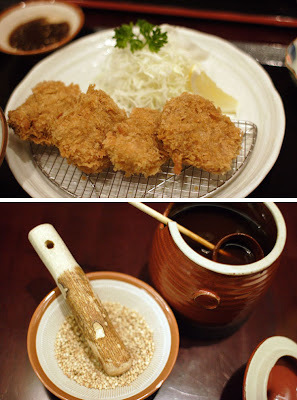 Took a lunch trip to Motomachi Shokudo, this was the first time visiting this small spot. The seating there was uncomfortable, we sat on what looked like a stepping stool made out of wood, plus I don't think they turn on the heat there. It is my understanding that Ramen restaurants have a fast turnover of patrons so comfort in the restaurant is not their primary concern. The restaurant is a very nice looking place but small. 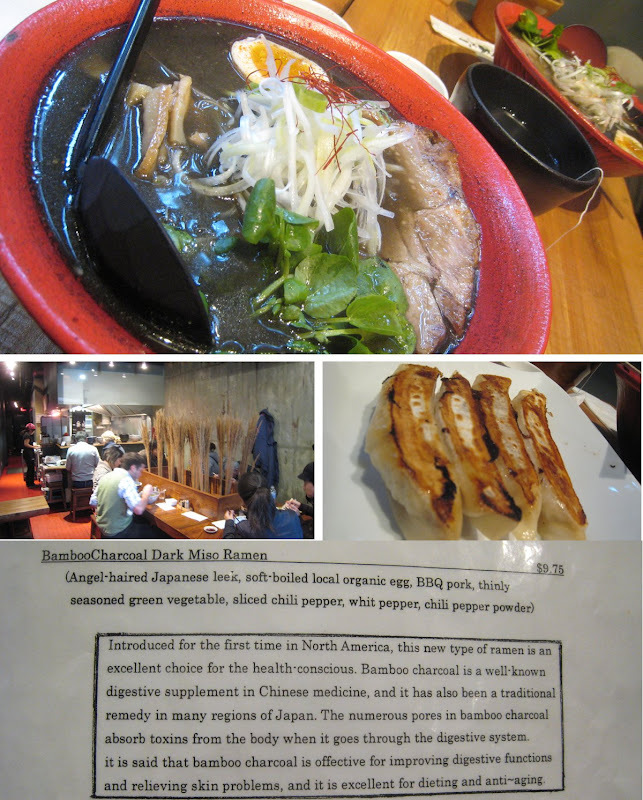 We sat down fairly quickly and we all ordered the bone charcoal Ramen (description can be found in the image below). The soup came real quick and looked great. I ordered the Bamboo Charcoal Dark Miso Ramen for $9.75. The presentation was great, the soup had one large piece of pork in it, a half of an egg, bamboo shoots, and sliced chili peppers. The broth tasted good. My gold standard is Ippudo in NY which was just incredible, and this soup did not come close to comparing to that. The angel hair noodle was tasty and so was the soup as a whole but nothing incredible. The bamboo charcoal tasted good and added a little grittiness to the soup, the charcoal is supposed to help your body digest the food, and can help with your skin. I will compare this ramen to the other spots in the end of the month. We also ordered Gyoza but they forgot about it and we had to reorder. They were super long in shape but they were tasty. I think my favorite gyoza in the city is the Shiru Bay Asparagus shrimp joints, those are incredible. The service was good but we were a little slow to get the bill. They also struggled when we all said we wanted to put $14 dollars on our credit card. I thought they were going to call head office because the two of them were struggling to figure it out. Eventually we paid and got out of there, but things always get a little weird when you break the system in a Japanese Restaurant. I think this place will rank in the top for ramen in the city but I would like another chunk of pork in my soup. You can however add more bamboo shoots/corn/green onions/butter etc to your soup if you like for some more money. Close to Denman and Robson. I saw some friends in the restaurant who were visiting because they were going through the VancouverMagazine 101 (local) Things to Taste Before You Die. A good friend rolled back into town and we decided to get together over dinner. Knowing that my friend has the lock on some of the best Chinese cuisine in this city i got him to choose the spot. He took me for a drive down to SE Marine & Fraser to a down low spot called Wonton King. 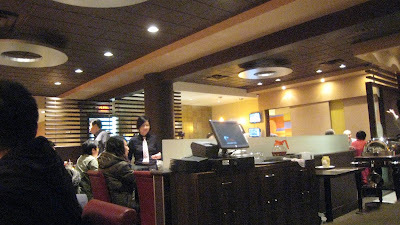 The decor and atmosphere was your typical chinese restaurant. My friend pointed out that the Peking Duck was their specialty and told me that we had to try it. So we ordered the Special Duck plate for $35 and the Egg Tofu dish. The Duck comes in 2 courses: first, the Duck Skin here has a good amount of meat on it, which we both prefer over just the skin like most places. You wrap these in a thin flour wrap w/ a little green and sauce. Amazing! They give you enough Skin & Wraps for a good 15 or so delicious servings. 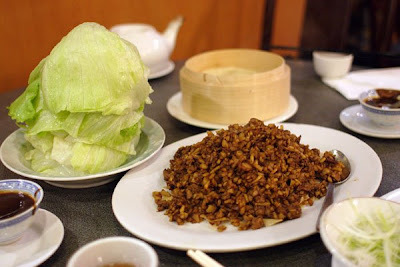 Second, the duck meat is chopped up with bamboo and chinese mushroom into a stir fry, and served with a tower of perfectly shaped fresh crisp lettuce. The stir fry was mad tasty. There was enough for another 2 people. 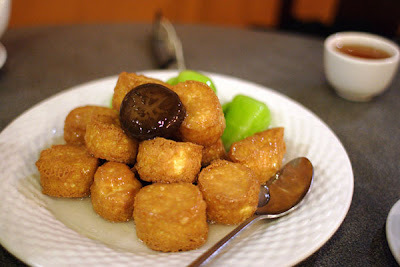 Lastly the Egg Tofu came served with bok choy and chinese mushroom with a nice starch glaze over them. These small pucks of egg tofu were so good. crispy on the outside and soft inside. On top of the great food here, the service was surprisingly good. To me, chinese joints aren't known to have the best service but the service here was Great, making this spot a "must try". The Special Duck and Egg Tofu with tax turned into a $50 bill, but we had enough leftovers for a whole other meal. And we were stuffed! We got the rest to go and took our time and drank tea to help digest. You could easily feed 4 people with what we ordered. We got friendly service right to the door. Try the Special Duck at Wonton King. I believe it's one of the best in the city. Wonder how their Wontons are? I was going to check out the Taste Of Yaletown but I am not a super fan of Yaletown, I generally dislike the lack of parking and the pink velour tracksuits but love the food there. So I called the Pinky's nearby and they said they are offering a Georgia Straight special which is the same thing as the Taste Of Yaletown. For 25 dollars you get your choice of appetizer, an entree and a dessert, which we found to be a great deal. For my starter I opted for the French Onion Soup over the Ceasar salad. The soup was great, nice and cheesy, hot, and it wasn't salty which is a pitfall for many french onion soups. For entree, I had the 7oz sirloin steak, done medium rare. It came accessorized with a few onion rings, a fantastic baked potato, and some fresh horseradish. The steak for the price was a great taste, it wasn't amazing but for the price it was delish. Comparing it to the Keg it matches it on par and was cooked to perfection. For dessert I enjoyed the chocolate pecan pie which was fantastic, the marriage between pecans, chocolate and the whipping cream was just perfect. 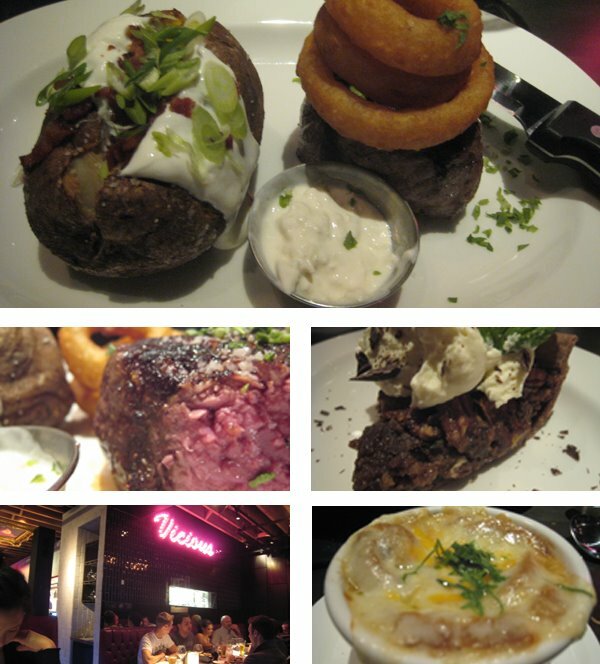 The stinky part is the atmosphere is cheesy, Pinky's is part of the Brown's Restaurant chain, and therefore has the same cheesy atmosphere as you would see in Cactus Club or Browns but the service and food was good. The bonus was we ordered a bottle of wine and what we didn't finish was corked up for us to take home. A nice road pop for the walk home. I would return for the 25 dollar deal in a heart beat. 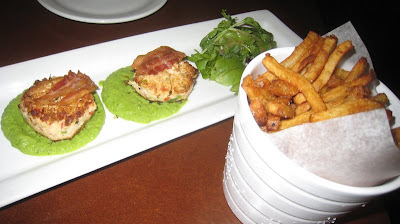 In September 2008, I tried to find the best burger in Vancouver. I was not able to go to all the spots but I think I covered some of the major players. I left out the fancy places like Diva at the Met because I am not dropping 50 dollars on a burger. Check it out. Click on the link below. Let me know which spots I missed. This could be the last place you would see Ex Canuck Defensemen Jeff Brown. 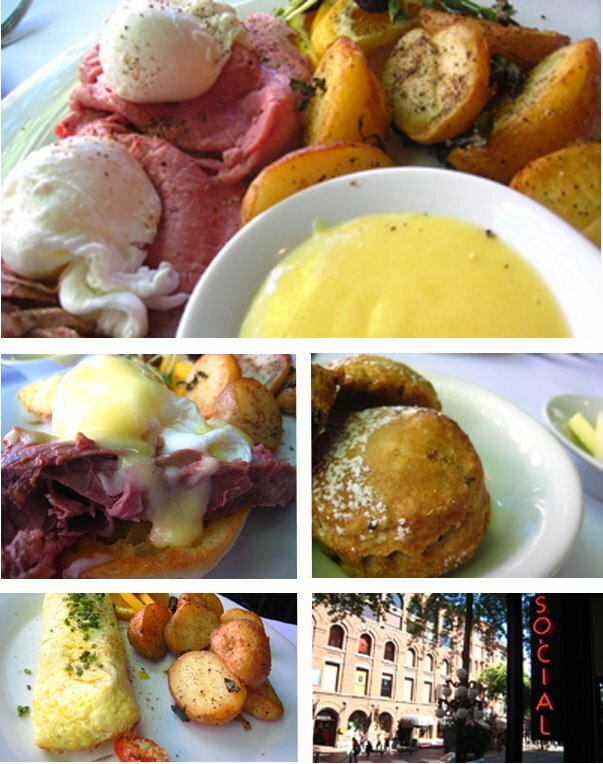 Social which is part owned by Kirk McClean sits at one of my favorite places to eat a Sunday Brunch. We managed to get a seat inside right at the window where we could people watch the patrons of Gastown. The atmosphere in Social is great, very clean, with a great view of Water Street. One of the fantastic things is that not many people go here so there are never lines. The thing I love is that after you order they serve you some biscuits that they made that day. On this day, we received some cinnamon biscuits, unfortunately our brunch was a little late in the day the biscuits were hard as a rock. I ordered the Salt Beef Eggs Benedict with melted onions for 13 dollars and it was fantastic, the cold beef taste mixed with the warm eggs was surprisingly great. Some potatoes were a little hard in the middle which made me sad because I really like this spot. According to my friend the coffee is good, which is a big added bonus. This spot is located on the top floor of the Shirokiya department store a the Ala Moana shopping center. the mall has a lot of food spots to offer from a full size food court to high end restaurants but this was our favorite. Shirokiya upstairs is like our Fujiya. you can get your Japanese groceries done and get your bento fix. but this place kills Fujiya by a mile (that's 1.6 kilometers). 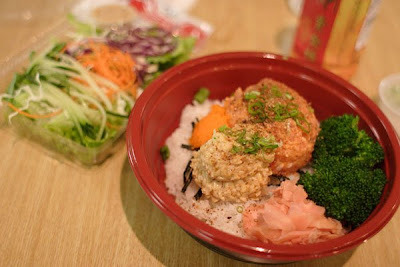 they've got everything from bento boxes, sushi, tako yaki, yakitori.... the menu goes on. out of all this the fresh rice bowls caught my eye and had to drop in. the nice lady behind the counter made me up a #12: spicy ahi tuna and natto (fermented soybean) on rice. you get to select your rice: white, sushi rice, or brown. went with the staple white rice. 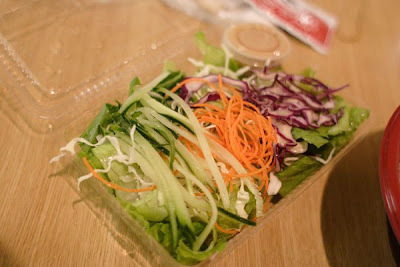 then you get to pick out a side: miso soup or salad. went with the salad. the healthy serving of rice was topped up with plenty of ahi, natto, a bit of masago and for added color some broccoli. the salad was fresh and came with a great sesame dressing. all this you see above was $8.00! the food was fresh and very tasty. best deal in Hawaii. i gave it four and a half Shakas. 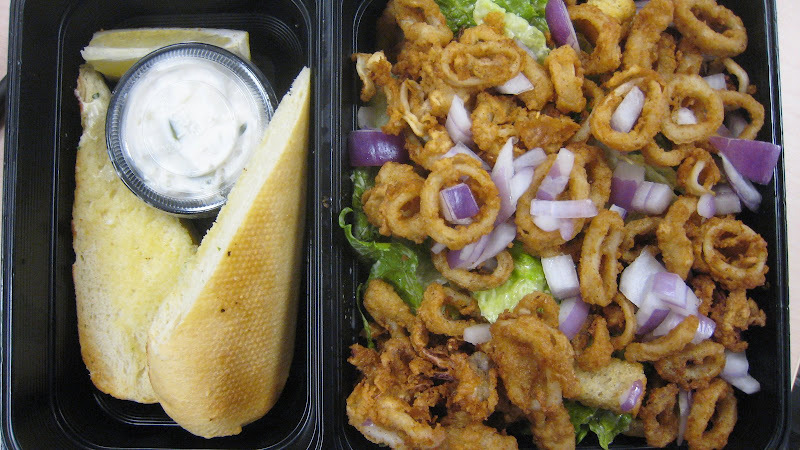 The only thing close to my work that is worth ordering from is White Spot and the the only thing worth ordering from White Spot is the burger and this, the caesar salad with calamari for 11 bucks. It is a great combination, a nice crisp caesar salad and crunchy deep fried pieces of squid. This is actually listed on the menu to, I just love biting into the calamari and then adding some lettuce to make that je ne sais quoi taste but it is great. You also get two pieces of garlic bread and some tzatiki sauce. Screw having chicken on your salad get squid, how hype does that sound?